Caecilians are a form of legless amphibian found in tropical and subtropical regions of the world. Bangkok has one species of caecilian – the Yellow-striped Caecilian. My cats take in caecilians now and then (not often but it happens) and they have not looked like this. One had about the same colour but not the yellow stripe and one was more bluish and still no yellow stripe on the side. However, they were only like 10 cm long. Do they change colour as they grow or might there be more species around? Those don’t sound like yellow-striped caecilians. Are you in Bangkok? There are definitely other species elsewhere in Thailand. If you are in Bangkok itself, then other species would be news to me, so I’d have to do a little more research and get back to you. it seems as though caecilian species and their ranges are not so well characterized at this point. I would say that is certainly true. 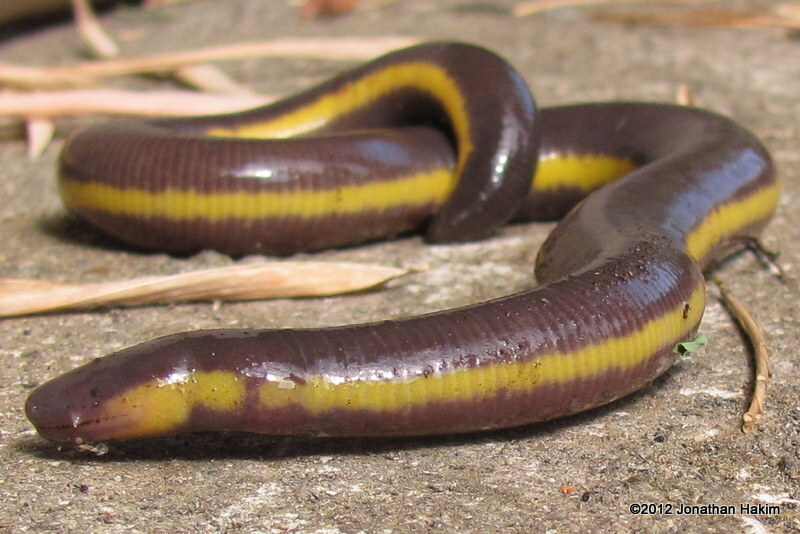 In this case, the official species reptiles and amphibians spcecies list made for Thailand ten years ago states that yellow-striped caecilians are found in Bangkok…but I’ve never seen one and I don’t know anyone else who has seen one. That compares to, say, Payao or Chaing Mai, where you can’t walk around during rainy season without tripping over them. And the list has been wrong about a couple other amphibian species (some common species are assumed to have a country-wide distribution, when in fact this particular low-elevation section of Thailand’s Central Plain is void of a number of otherwise common species). So I’m neither certain that yellow-striped caecilians actually do occur here, nor do I know whether there may be some other species of caecilian that have yet to be officially recorded here.